Mix tomatoes, onions, ginger, fish sauce, salt and ground pepper in a bowl. Fill the center of the fish with the tomato mixture. Fold fish and wrap the fish tightly with the cleaned banana leaves and refrigerate for 15-20 minutes. Grill fish wrapped in banana leaves in charcoal for 10-15 minutes on each side or till fish is fully cooked. 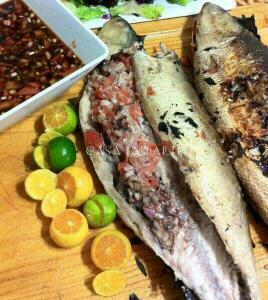 Remove from heat and serve with vinegar or calamansi and soysauce mixture.